It is no secret that the Philanthropic Educational Organization (P.E.O.) Sisterhood helps women to succeed. The P.E.O. Sisterhood is an international women’s organization whose primary focus is providing educational opportunities for female students worldwide. This philanthropic society has been supporting students through scholarships, grants, awards and loans since 1869. There are 181 chapters in Oregon, with 11 located in the Eugene - Springfield area. These local chapters successfully advocated for P.E.O.’s Annual State Convention to be held at the Hilton Eugene and Conference Center. At this convention, the sisters of P.E.O. come together to celebrate, learn about upcoming education projects, and hear stories from one another. For five days, the Eugene - Springfield area members hosted their sisters and showcased the community with local favorite activities, including tours of Ninkasi Brewing Company, King Estate Winery and the University of Oregon. Though 200 delegates attended, they brought along family and friends, bringing participation numbers to about 650 people. The 2013 P.E.O. 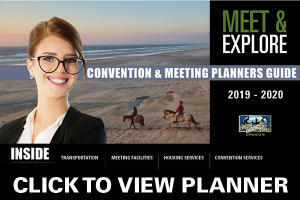 Annual State Convention generated over 1,400 room nights, and an approximate economic impact of $388,000. Travel Lane County congratulates the P.E.O. 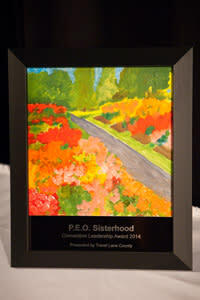 Sisterhood on winning the 2014 Eugene, Cascades & Coast Convention Leadership Award for their Annual State Convention. 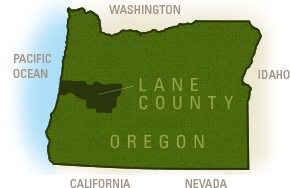 This award is presented to a local resident or business directly responsible for a meeting or event that brought in a significant number of overnight visitors to Lane County.